Can't wait to see 'em! I saw this bit of news when Toywiz put them up for pre-order yesterday. I kinda miss the animated style one from Zazzle. 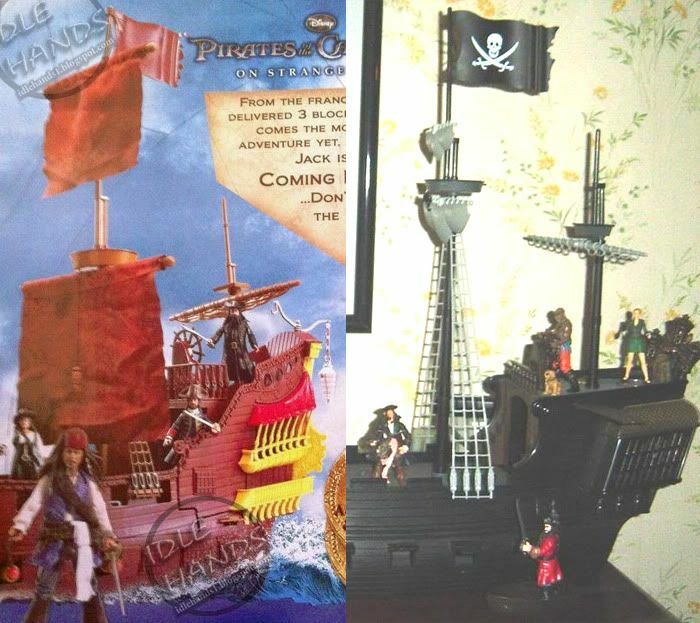 I think that owes more to the fact that the moviemakers refitted the actual Black Pearl to make the QAR for the movie. I don't know if Jakks had access to any Zizzle molds. I'm going by the look of the hull and cannon ports and the crow's nest looks the same as the Zizzle one with the retractable zipline. The captain's quarters part of the ship looks different, but that could just be the additions... Going to try to get to my BP today and compare to the pics, but it's not hard to imagine Jakks buying or leasing the molds from Zizzle like Mattel buying Batman molds from Hasbro when the license changed hands. I don't have the Ultimate Black Pearl (sadly) to compare. It'd certainly save Jakks considerable tooling dollars to be able to retool the Zizzle mold, rather than create an entirely new mold. If you can get to your Pearl, let me know what you discover. And, hey, have you started your POTC display barrel project yet? I'm dying to see how that turns out. I'm curious to see how the Jakks 4" line fits with Zizzles which, I believe, were 3-3/4". But, then, is Jakks truly 4" or are they just calling it that? Gah! I want these figures now! Not yet... Need to clear out a LOT of space before I start that... Also kind of want to get a feel for how much stuff Jakks is going to be doing (really hoping for some CotBP stuff like Anna Maria and cursed pirates). EDIT: Just re-read... FIVE SERIES OF 4" FIGURES PLANNED!!! Now I'm fairly excited for this line. Really glad to hear they are using the "Real Scan" technology, all these products look great and the character variety for the 4-inch line is fantastic! I don't think I will be getting these, unless I pick them up to use as Fodder, that's not to say these don't look cool because they are I just don't collect anything that isn't sci-fi.